Respiratory Health Association has developed print materials to assist and motivate individuals who are thinking about quitting smoking. These materials are appropriate for distribution in a variety of settings, including health systems, social service organizations, community-based organizations, and in the workplace. If you are looking for quit smoking information for patients, clients, or employees, read more about the print materials that are available for purchase below. 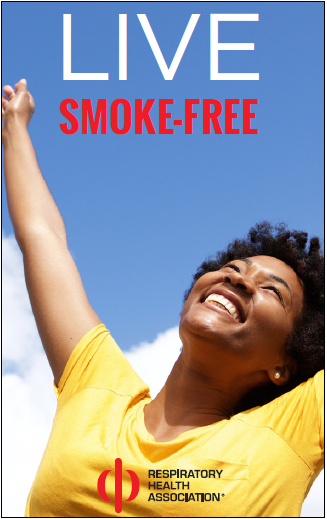 The 8-page self-help brochure provides an overview of the benefits of quitting smoking, tips to develop a quit plan, FDA-approved quit smoking medications, and quit smoking resources in the community. 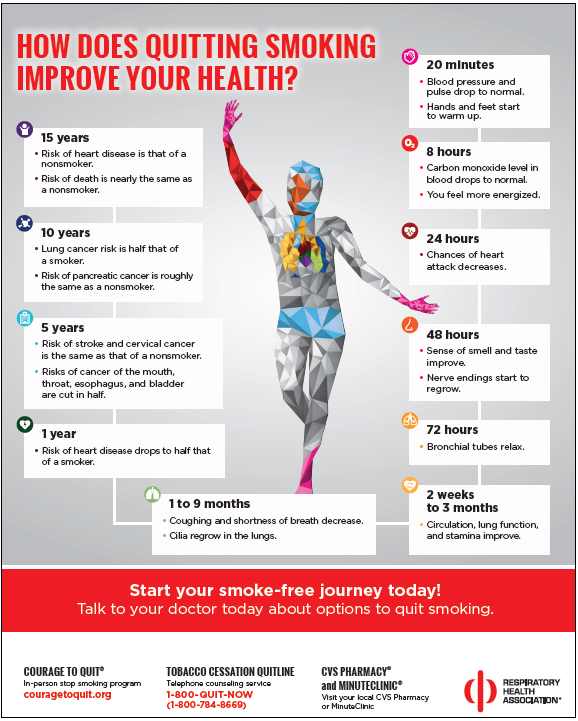 The 20” x 16” poster uses a graphic to illustrate the health benefits of quitting smoking over time to motivate individuals to start their smoke-free journey. The poster encourages individuals to talk to their health care provider about quitting and lists quit smoking resources in the community. We recommend displaying this poster in areas where it will be visible to patients, clients, residents or community members. The 8.5” x 11” sheet illustrates the health benefits of quitting smoking in a format that is easy to read and display. We recommend providing this resource to individuals to help motivate them on their quit smoking journey. The palm card is the size of a business card and lists quit smoking resources in a small, easy-to-carry format. This can serve as a reminder to individuals of why they started their smoke-free journey or help with enforcement of smoke-free building and campus policies. The tear pad contains 50 easy to tear quarter-page sheets that encourages individuals to get support to start their smoke-free life and provides information about quit smoking resources in the community. 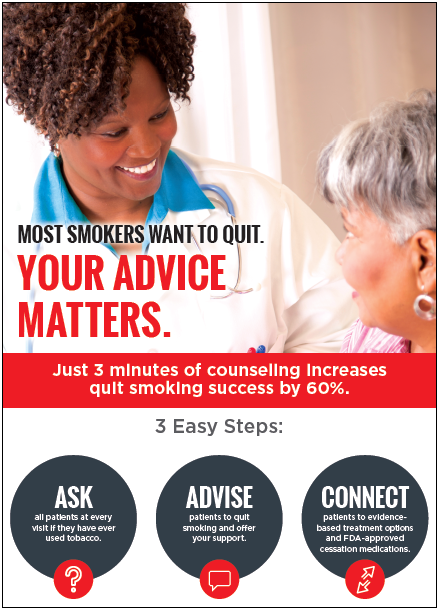 The 8.5” x 14” poster complements RHA’s Counsel to Quit® brief clinical tobacco intervention program and encourages health care providers to screen patients for tobacco use, advise them to quit smoking, and connect them to evidence-based treatment options and cessation medications. We recommend displaying this poster in areas where it will be visible to health care providers, such as breakrooms, kitchens, and staff lounges. To purchase any of RHA’s quit smoking resources, click here. Looking for resources in Spanish or Polish? These resources are also available in Spanish and Polish. To learn more or to place an order, contact Lesli Vaughan, Senior Program Coordinator, at [email protected] or 312-628-0208. 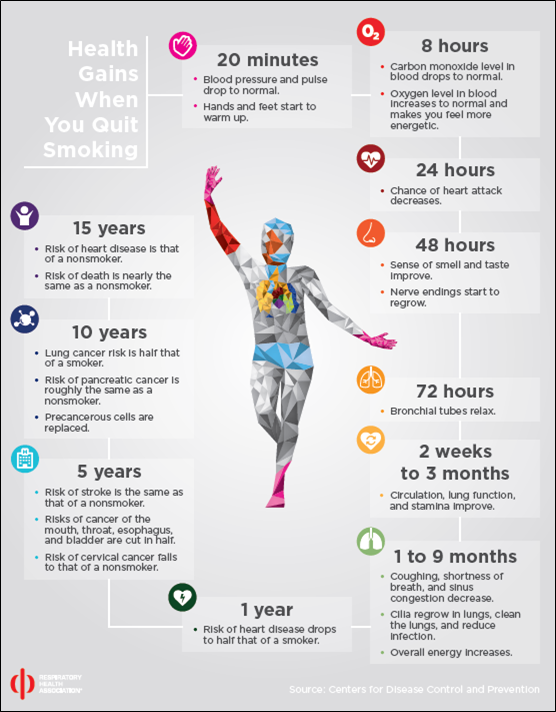 Looking for quit smoking programs? 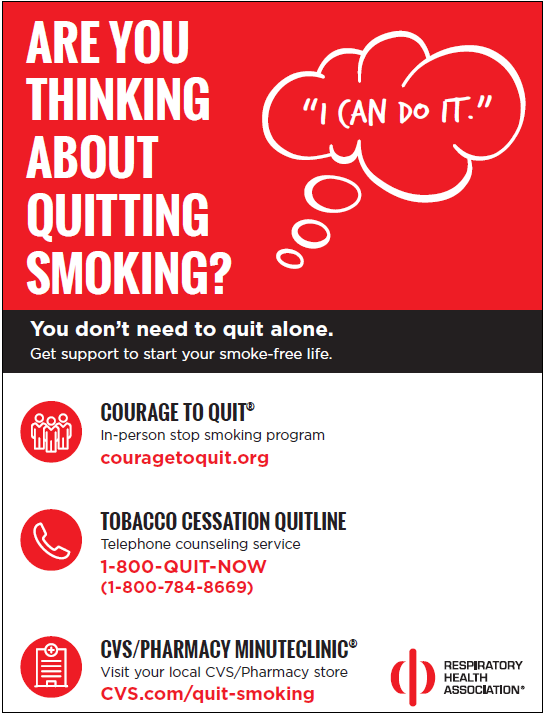 To learn more about Courage to Quit®, RHA’s quit smoking program, click here. 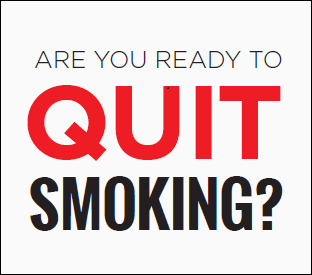 To learn more about Counsel to Quit®, RHA’s brief clinical tobacco intervention, click here. If you have any questions or want to learn more, contact Lesli Vaughan, Senior Program Coordinator, by email at [email protected] or by phone at (312) 628-0208.